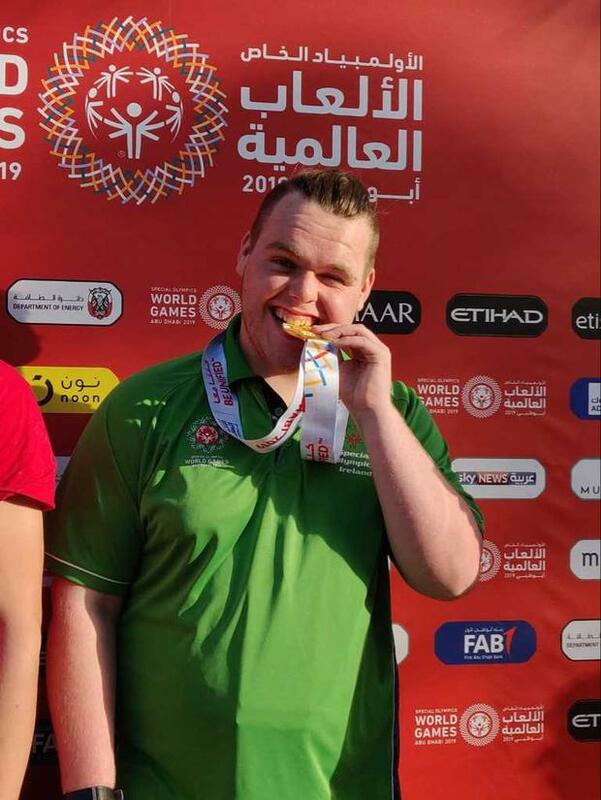 Oisin Feery won two medals at the Special Olympics. WHEN kayaker Oisin Feery started school he was non-verbal...now he’s going back to the same place inspiring the next generation to let them know that anything is possible. That was before the Special Olympic World Games happened, and when he goes back to Tullamore, Co. Offaly, his message will be strengthened by the two Olympic medals he'll have wrapped around his neck. A breathtaking finish saw Oisin (17) defeat Lithuanian, Rolandas Kriauzlys by a hairs breadth and that was followed up by a bronze later in the day. In Abu Dhabi, as the sun rays reflected off the blue sea onto the ever-increasing number of glass skyscrapers, the message was less about the winning and more about a movement that is transforming lives. "It has a massive effect, it kind of gives you an attitude you can bring everywhere really, in everything you do. It kind of gives you that extra push to do different things as well...an outgoing attitude, trying new things, to experience them and learn from them," Oisin explained. His mum, Sharron explained that when Oisin started school he wasn't speaking at all. "He didn't like to talk in the classroom, he was considered non-verbal as he didn't have full vocabularly at the time, but over the years and through his sport and all the intervention, Oisin has come on leaps and bounds and looking at him go back [to schools] and give full speeches, talk in his own words in the classroom and answer questions and engage with children is just amazing, it's testimony to him and how hard he's worked," she said. In total the kayakers – which included Michelle O'Keane, Deirdre O'Callaghan and Fergal Gregory – clocked up six medals. And with 20 gold medals, 22 silver and 16 bronze, Team Ireland are in a rich vein of form going into the last couple of days of competition. Over in Dubai, the heat picked up in the athletics stadium in every sense of the word. Walking off the track after a silver medal in the 400m walking, Castleisland's, Gary O'Sullivan noted the temperatures were a hell of a lot different to the Kingdom or Abbotstown. "I've never trained in this heat before, I trained up in Dublin where it was cooler and it's warmer here, and I'm just happy it finished so I'm here to represent my country and hopefully bring home more medals," he said. Gary's influence has sparked even more interest back home from those with intellectual disabilities. "I seen on Facebook there yesterday, this woman from Castleisland my hometown, she put up a picture on Facebook of her grandson saying 'can you please take me to the Special Olympics with you next time'," Gary added. And with a bronze in the 25m run earlier this week, Shannon Nixon certainly wasn't shy in front of the cameras...though it wasn't always the case, dad Martin explained. "We're very lucky to have a child in the Games and very humbling because it's a fantastic event with great athletes in it," he said. "I would say she's always been bubbly and happy-go-lucky but I would say the attention that she gets now in Special Olympics has really brought her on, it helps socially as much as anything else. "She's just part of a squad that enjoys themselves. All these athletes are having the time of their lives, medals or no medals. "It's only the other day that Shannon said she wants to be a coach once she finishes the World Games, so that's something that she can try to be." Independent.ie Sportsdesk The war of words between Sir Mo Farah and Haile Gebrselassie continued on Thursday as the Briton's coach accused the Ethiopian great of lying. Independent.ie Newsdesk Mo Farah is embroiled in an extraordinary war of words with fellow distance star Haile Gebrselassie over a stay in his Ethiopian hotel. By Cathal Dennehy Two-time Olympian Natalya Coyle has urged young Irish sportspeople to beware the dangers of under-eating in a bid to improve performance.